Minimum bore diameter with footed rod 5/16". Thickness of measuring foot .050". Measuring rod diameter 1/8". Total inreach - adjustable 0-6". -5/8" x 4" hardened and ground measuring base. 1/8" measuring rod travel. Supplied with AGD Group 1 .0005" dial indicator with 1/8" travel and revolution counter, one footed rod, one plain rod & fitted storage case. Minimum bore diameter 1/2". Total inreach - Adjustable 0-6". 1/8" measuring rod travel. Thickness of measuring foot and locating disc .050". Measuring rod diameter 1/8". Supplied with AGD Group 1 .0005" dial indicator with 1/8" travel and revolution counter, one footed rod and fitted storage case. Minimum bore diameter .750". Total inreach - Adjustable 0-12". 1/2" measuring rod travel. Thickness of measuring foot & locating disc .050". Measuring rod diameter 5/32". - Supplied with AGD Group 2 .0005" dial indicator with 1/2 " travel & revolution counter, one footed rod & fitted storage case. All 700 series models are supplied with fitted storage cases. Available in two styles and in two sizes. Models 700 and 707 feature rectangular base for use as fully adjustable depth gage. Additional uses include checking groove location from face of part and groove width at the same time. Models 709 and 711 are supplied with extensions featuring an adjustable locating disc for checking the distance from the face of a counter bore to a groove or from one groove to another groove. Groove widths may also be checked with one simple motion that reverses the gaging direction of the footed rod. Adjustable depth range form 0 to 6" or 0 to 12" depending on model. Supplied with .0005" dial indicator with revolution counter. 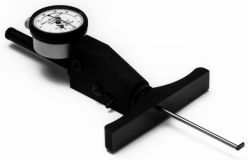 .0001", .01mm & .002 mm dial indicators available.May be set with gage blocks or other suitable means. No special skill required to set or use gage. Longer measuring rods and special measuring feet available. Instant reverse capability for changing gaging direction of footed measuring rod. Supplied in protective storage case.